A versatile and best adjustable weight bench is vital for anyone who is serious about strength training or bodybuilding and wants to achieve results fast and without straining their body or risking any types of injuries. The Ironmaster Super Bench is therefore one of the top choices you can consider not only because of its extremely high weight capacity, but also because it has an excellent craftsmanship that makes it a treat for both your body and your eyes. Perfect for rack, cage, Smith machine and dumbbell use. Build on its already impressive level of versatility with the optional attachments. Possibility to adjust to eleven angles from decline to upright. Rated for a massive 1000 pounds. 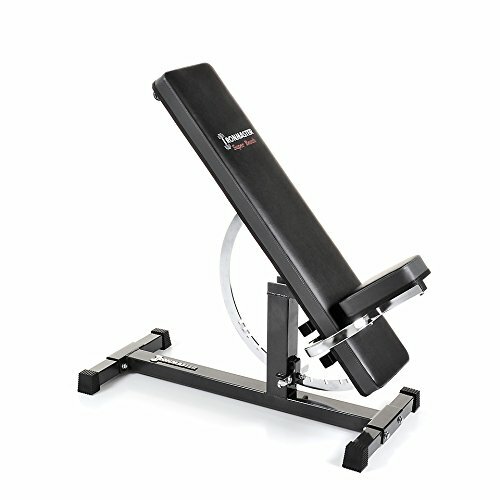 The Ironmaster Super Bench features a unique design that can be adjusted to eleven different positions, making it perfect for everyone who wants to perform exercises in various decline to incline positions. As you can already tell, this is a very versatile weight bench that’s considered and excellent investment if you’re looking for a mid-range weight bench that is durable, easy to use and won’t take up too much space in your home. The Ironmaster Super Bench is not an ordinary weight bench that is to be used for sticking under your Smith machine or squat rack. In fact, you can use dozens of other attachments with it, allowing you to do any type of exercises you want for building up a well toned body and also bulking up. You know very well that many other weight benches only allow you to train specific areas of your body, but the Ironmaster Super Bench takes things to a whole new level, giving you the chance to train every muscle in your body . The Ironmaster Super Bench is a very stable weight bench, meaning that no matter how much weight you put on it (up to 1000 lbs) it won’t wobble at all. There are 4 rubber feet that limit wobbling and hold it into place while exercising and you’ll immediately see and feel the difference if you’re coming from a lower tier weight bench. One thing to keep in mind is that you need to take great care before you decide to buy the Ironmaster Super Bench and include it in your home gym. That’s because it comes with a curved system that locks into place once you decide on the height you want to use. In contrast, regular weight benches have a standard adjustable bar that is used for modifying the bench’s position. The truth is that you’ll get to love this new and unique design after a while, since it not only is aesthetically pleasing, but it also gives the weight bench a modern look. Last but not least, keep in mind that the Ironmaster Super Bench is a bit smaller compared to other weight benches on the market. It measures forty four inches in length, which means that if you’re a taller individual, it may not be the best choice for you. Overall, the Ironmaster Super Bench is a breath of fresh air in the weight bench market, offering you the chance to use it with dozens of other attachments and since it has a 1000 lbs capacity, people of all sizes can comfortably and safely use it without the fear of it wobbling.